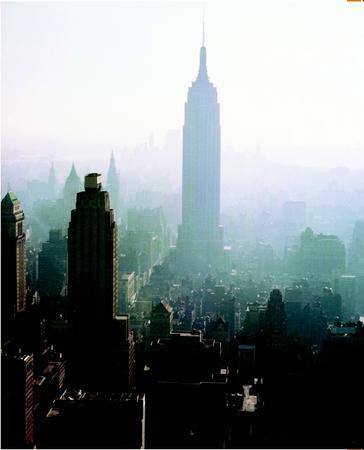 Many cities have found ways to limit the very visible form of pollution called smog (smoke+ fog= smog), but on some unfortunate days industrial and automotive pollution can mix together with inopportune weather conditions and form unhealthy levels of smog in the air, leaving a hazy blanket over a city. The problem intensifies in cities surrounded by mountains and on warm weather days. Smog causes harm to humans, animals, and plants. 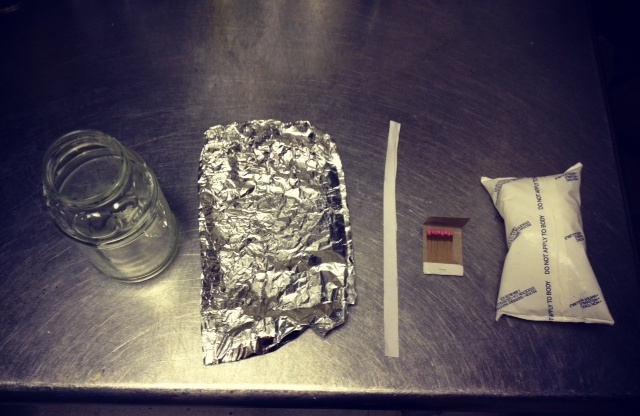 Do this simple experiment in the classroom to see fog form in a jar! Adult supervision required! 1) Cut a strip of paper about 10 in x 1/2 in. (25cm x 1.25 cm). 2) Fold the length of the strip in half and twist the paper. 3) Make a “lid” for the glass jar by shaping a piece of aluminum foil over the open end of the jar. Take away the foil and put it aside. 4) Put some water in the jar. Swirl it around so the inside walls of the jar are wet. 5) Pour out the water. Make sure there isn’t any water pooling at the bottom of the jar. 6) Place 3 ice cubes on top of the foil to make it cold (I used an ice pack). 7) Ask an adult to light the strip of paper. Drop it and the match into the damp jar. 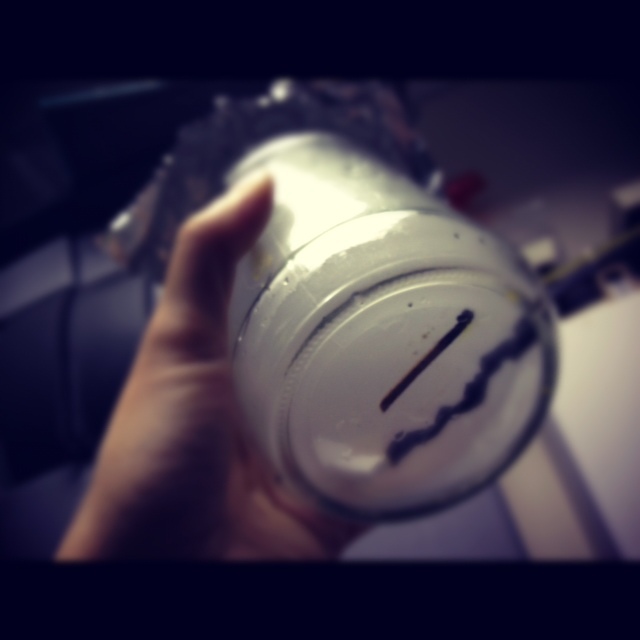 8) Quickly put the foil lid on the jar and seal it tightly. Keep the ice cubes on top of the foil, in the middle. What do you see in the jar? Have you ever seem this in the sky? Could the air still be polluted on a visibly clear day? 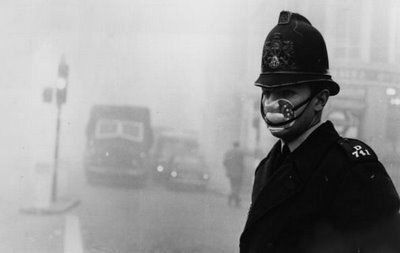 This offers a prime chance to discuss the deadly London smog disaster of 1952, one of the worst environmental incidents in history. During a very cold but windless week, many Londoners burned more coal than usual to heat their homes. 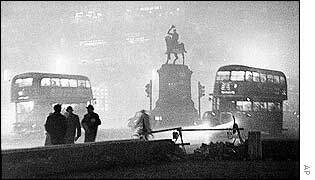 This pollution combined with the pollution from coal powered power stations created a thick layer of smog in the air which severely affected the respiratory tracts of many people. The smog killed 4,000 people and shut down all road, air, and rail transportation in the city! This event would come to inspire environmental research, government regulation, and public awareness of the relationship between air quality and health. Getting students to take note of smog, soot, and visible pollution in their neighborhood can be an eye opener, but it’s also important for students to understand that not all pollution is visible and that we can’t see or smell some of the most harmful pollutants. For instance, carbon dioxide didn’t even qualify as a pollutant until scientists proved that its role in the greenhouse effect helped contribute to global warming. If you want an interactive fun way for your kids to learn about the major air pollutants affecting our planet and our health, have them perform a play with a very unique cast of characters. “The Awful Eight” is an air pollution play developed by the Texas Natural Resource Conservation Commission. Common pollutants are brought to life by students and given personality traits based on their harmful effects. These eight pollutants are picketing against the Environmental Protection Agency and the Clean Air Act. Our now familiar gang of “Particulates” chants “Dust, soot and grime, pollution’s not a crime! Soot, grime and dust, the E.P.A.’s unjust!” while sly Carbon Dioxide brags about sneaking into the air when cars burn fuel inefficiently. After covering the awful environmental and health costs of each pollutant, Carbon Dioxide points towards the audience with a daring claim. It’s not CO2’s fault the earth is warming: “The reason you’re in such a mess is because you use so much fuel and cut down so many trees!” Harry Wheezer agrees and turns to the audience for ideas on how to fight air pollution. 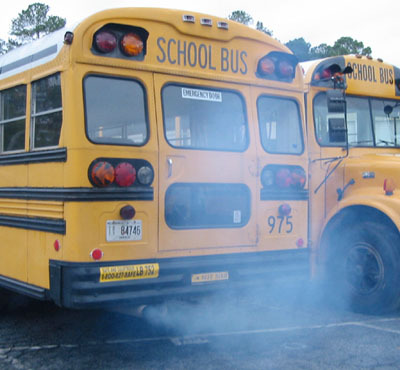 Thinking about traffic and transportation may have piqued your students’ interest in air pollution. Smog is every city kid’s constant companion. Why not take the class on an air pollution walk around the neighborhood? They can see soot building up on windowsills and awnings and smell the black clouds behind the bus. Back in the classroom, ask if any of the students suffer from asthma. Air quality and asthma rates in schools are important environmental justice issues in our city. Check out this NYTimes article covering a five year air quality study New York University researchers conducted in the South Bronx where 17% of school aged children have asthma. The study investigated how local air quality relates to factors such as traffic and the number of waste-transfer stations within a close radius. Researchers took air quality readings at ground level from eight different sites and also had students help out by wheeling around special air quality book bags and keeping diaries of their asthma symptoms. “The study found a strong correlation between asthma hospitalization rates, poverty, the percentage of Hispanic residents and the number of industrial facilities in the Bronx, with Hunts Point having by far the highest number and density of industrial facilities.”- Bill Egbert, New York Daily News. For an easy test of the air quality around your school, try hanging a paper coffee filter coated in Vaseline outside your school, and hang one inside a Ziploc bag as a control. Secure the coffee filters so they can’t blow around, and make weekly observations as a class. In a few weeks, you should start to see discoloration and buildup of particulates from the air. 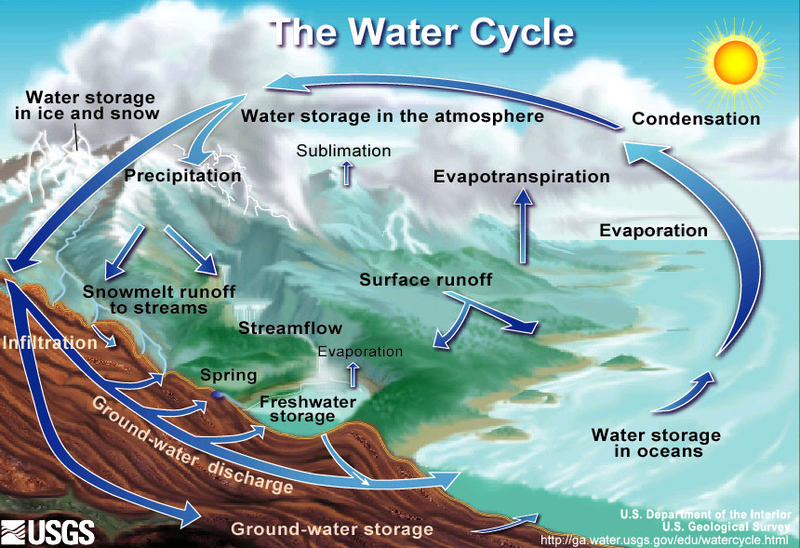 As this image from the United States Geological Survey shows, the water cycle has many steps and can go in multiple directions at the same time. It’s a lot for students to learn! To help them, we have a great game recommendation for you to help students see the full complexity of the water cycle in action. The game requires a little bit of set-up, but is very simple. Each student portrays a molecule of water that moves through the environment. There are markers for each of the places a water molecule can go: animal, plant, cloud, groundwater, lake, ocean, river, glacier, and soil. Once there, students roll a die (template included online; has to be assembled before playing). Each face of the die is something that can happen to that molecule. 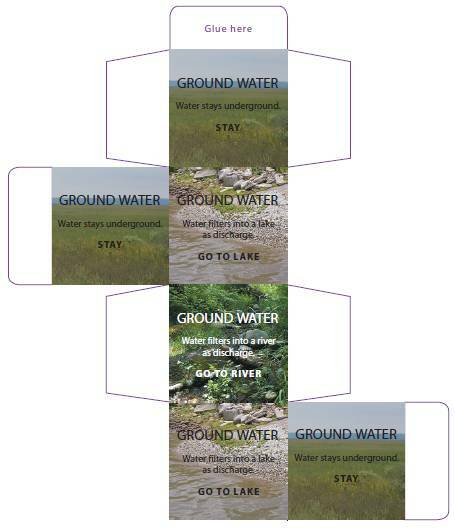 In the case of a molecule of water currently in the ground, it could stay underground, filter into a lake, or into the river. Each student rolls a die and then moves or stays accordingly. After playing the game for 10 turns or so, the game stops and students chart where they went. It gives students a fairly complex understanding of the possibilities in the water cycle. The full instructions and materials are available on NOAA’s website for free download. Extensions: After doing the game, the instructions suggest extensions for math or an extension to study how pollution moves throughout the water cycle. In New York, the water cycle is taught in 4th grade, although in practice it often happens earlier than that. Students are taught that due to a series of forces, water cycles through the Earth and never disappears. The problem with this explanation of the water cycle is that it doesn’t quite account for water conservation – if water is infinitely recycled throughout the Earth, then what’s the danger of taking a 30 minute shower? I didn’t “waste” the water because it can never go away! The water that evaporates does not necessarily fall down straight where it evaporated. Water moves through the air. If individuals living the desert use up all their groundwater to water artificial lawns, the water that evaporates will rain on a different part of the world and the desert town will be even drier than it was before. When humans interact with water, they run the risk of polluting the water. Whether its poop, fertilizers, soap, or something else, every time we use water to flush our toilets, water our plants, or wash our hands, we add chemicals to the water. 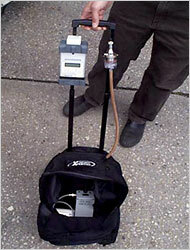 Those then have to be filtered out before the water can be safely returned to the rivers, lakes, and oceans around us. This process of treating the water is time consuming and expensive. The less water you use, the less treatment is needed, the more water is available for future use by humans, other animals, or plants. Like many things we teach children, the water cycle is both simple and complicated. Giving students a more complicated picture of water will help them understand the semi-paradox that no water ever disappears, and yet we can waste water. Tomorrow, we will return to the water cycle with a great water cycle game for students of all ages. PS: For a water cycle resource for early childhood, check out Round the Garden, which tells the story of the water cycle through gardening. Icky Fest is an annual tradition here at Brooklyn Children’s Museum. Every year since our re-opening in 2008, we hosted a weekend devoted to all things gross! During the weekend festival, kids become grossologists—scientific experts on all things slimy, yucky, and downright disgusting. They can create their very own snotty slime, touch creepy creatures, smell pungent cheese, study the New York City sewers, and more! Come to Brooklyn Children’s Museum on Saturday, November 19th to check it out. CUP will be doing demonstrations at 12pm, 1pm, and 2pm in the Commons Theater. ICKY!